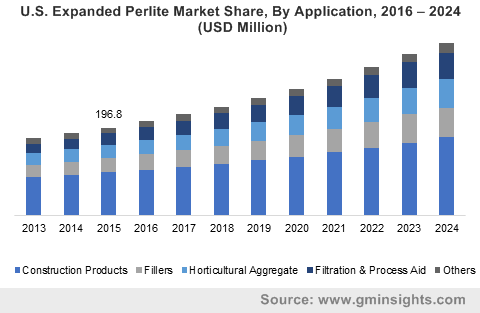 Expanded Perlite Market size was valued at USD 710.4 million in 2015 and is forecast to experience gains exceeding 7.3% CAGR by 2024. Global expanded perlite market size is positively influenced by robust growth in the construction industry in the recent years. The construction industry was valued roughly around USD 8 trillion in 2015 and is estimated to exceed USD 13 trillion by 2024 owing to stimulate industry growth. The product is used in the thermal & sound insulation panels, bricks, masonry products, blocks and other structural panels. It is used in green roofs, which is an upcoming and rapid growing segment for the industry growth. It is also used in foundries with ceramics to insulate furnaces. The industry players of the construction industry such as Inca Blocks Inc., extensively used the product as a filler and insulating material in the manufacturing cinder blocks. Furthermore, it is a preferred material in green buildings as it reduces energy consumption for heating and cooling. Inclining oil & gas industry is analyzed to drive the expanded perlite market size in coming years. The product is extensively used in filtration and process aid applications in water treatment plants, mining, and shale gas drilling activities. It acts as a soil aggregate to hold water, soil aeration and provides thermal insulation in oil wells. It is an inert material and is broadly used in formed products such as bricks, ceramics, and insulating panels on the walls of wells. In addition, the total oil rig counts were approximately 15 thousand in 2013 across the globe and is forecast to mark 20 thousand by 2024, thus contributing to propel business growth over the forecast timeframe. It is widely preferred ingredient in soil aggregates formulation used in horticulture. This mineral has excellent water retention properties that are extremely favorable for horticulture applications. On addition of water to the soil aggregate, the product does not swell or weigh more, but holds optimum water amount that aids better plant nourishment. Globally, horticulture activities are expanding due to rising horticulture produced products demand such as fruits, vegetables, decorative plants and seeds, especially greenhouse horticulture. In addition, horticulture produce accounts for over 22% to 26% of the global food and animal product trade. This will consequently drive the global expanded perlite market over the forecast timeframe. The product is safe for use in filtration of drinking water and beverages due to its inertness. After expansion, it develops a cellular matrix that provides a good filtering membrane. It is also used for filtration in breweries, especially beer, across the globe. Regulatory authorities worldwide have accepted the product as safe for use in food contact applications. Additionally, the global beer production was approximately 190 gigalitres in 2015 and is projected to reach 210 gigalitres over the forecast timeframe, resulting in expanded perlite market growth. However, the industry is negatively influenced by product substitute threat, which may hinder industry growth. It can be replaced by materials such as diatomaceous rock, barite, and polymeric foams for thermal insulation and soundproofing applications. The global expanded perlite market size for construction products is anticipated to witness growth exceeding 3% over the forecast timeframe. Cement mixture, concrete additives, boulders, masonry and bricks are the products which widely requires expanded perlite. These products are essential in almost every construction structures, this results in propelling business growth. The global expanded perlite market size for fillers was valued at over USD 100 million in 2015. Fillers applications refers to the inert additives that are added to space occupation formulations. The product is chemically inert, non-toxic and insulates against thermal, electric, and audio conduction. It is used as a filler in the personal care product formulations such as soaps and scrubs. It is also used in cinder blocks to fill the pores and provide thermal and audio insulation. North America, mainly led by the U.S. expanded perlite market share generated revenue roughly over USD 160 million in 2015. The regional growth was mainly due to presence of major producers and consumers in the region. Rising oil & gas industry in the region along with shale gas exploration in the U.S. will complement industry growth over the timeframe. Asia Pacific, majorly comprised of China, India and Japan dominated the global expanded perlite market share in 2015. Robust construction industry growth in the region was the main major propelling industry growth. For instance, China accounted for over 20% of the global construction spending in 2015. Increasing consumer awareness resulting in growing horticulture produced products demand such as fruits, vegetables, decorative plants and seeds will further complement business growth by 2024. Global expanded perlite market share was fragmented in 2015 owing to presence of large number of formulators/expanders in the industry. Key industry participants include Aegean Perlites SA, Perlite-Hellas, Supreme Perlite Company and Cornerstone Industrial. Other prominent industry participants are Perlite Vermiculite, Keltech Energies, Cornerstone Industrial Minerals and The Schundler Company. Major industry players including Aegean Perlites SA and Perlite-Hellas are engaged in backward integration during crude perlite mining. Expanded perlite is obtained after perlite processing and milling. Perlite is a volcanic siliceous mineral found abundantly in volcanic regions. It is an inert glass-like rock equipped with extremely beneficial insulation properties. When crude perlite is heated, it expands from 7 to 20 times its original volume. Expansion occurs with release of water molecules from the core of the mineral, causing reduction in density and weight of the mineral. Factors driving the global expanded perlite market size include increasing construction products demand, especially in Asia Pacific and MEA, rising horticultural applications and filtration & process aids applications. However, factors such as availability of the product substitutes for most applications is projected to hamper market growth during the forecast timeframe.